We supply a variety of Time Clock Enclosures for Waterproof and Security applications to protect the Investment of your Lathem Time Clock, Lathem PC100 and PC400 Badge Terminals or Touchstation. Find timeclock enclosures for most Lathem models, such as the model 2100 and 4000 Time Recorders, 5000e Plus and 7000e. In addition, customers that use Clock Terminals for the Lathem PayClock EZ and Pay Clock Pro time and attendance systems and the Hand Punch Biometric Terminals are now able to ensure the long-life of this more expensive equipment. 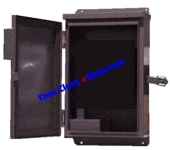 Need a Custom Lathem Time Clock Enclosure?...just contact us with your requirements.